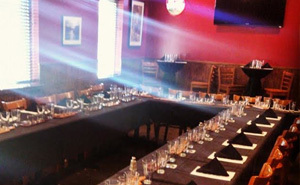 With our excellent food, fun calendar events and award-winning craft beer, Lynnwood Grill & Brewing Concern is proud of what our bar and grills brings to the Northwest Raleigh area. We love getting to know our customers, and you’ll find that our local microbrewery is the most comfortable, fun place to hang out and have a drink on this side of town. Watch the big game, join in our trivia night or enjoy a nice afternoon on the rooftop with friends. Our food goes well beyond average bar food by offering you delicious appetizers, specialty pizza, wraps, desserts and more. Our pizza ingredients, dough and sauce are made fresh daily, often featuring organic items. We make ordering convenient for our customers by offering online ordering and to-go pickup. 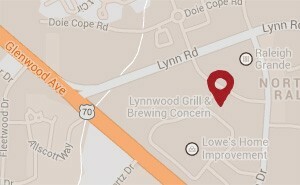 Complete your Lynnwood Grill & Brewing Concern experience by tasting our house-brewed beers in Northwest Raleigh. Our selection of belgians, blondes, stouts, IPAs and more are our pride and joy — we’ve won national awards for our Once You Go black IPA and Kiss My Irish Stout dry stout. Our weekly specials often feature our brews, so come back to try them all! Residents of Lynn Road, Glenwood Avenue, Hilburn Drive and beyond don’t have to travel far to visit our Northwest Raleigh bar and grill, so make Lynnwood Grill & Brewing Concern your regular place. If you want to hear about our weekly specials or place a to-go order, call (919) 785-0043. Lynnwood Grill & Brewing Concern proudly provides the Northwest Raleigh area with great food, fun events, craft beer, trivia night and more.